And the devil take the hindermost! In the days of your great-grandfather’s youth the Supreme Collegium chose a Cymric king to rule the land. Crowned Emperor Constantin, he ruled over warlords and chaos in the void where civilization departed with the Romans. The land was in ruins yet with the rise of Emperor Constantin some semblance of normalcy could enter again. He reigned well in difficult times, and in the Year of Our Lord 440 his son Constans succeeded him. Constans died in battle shortly thereafter. Vortigern then took the throne as his own and fought against the Pictish and Irish hordes. 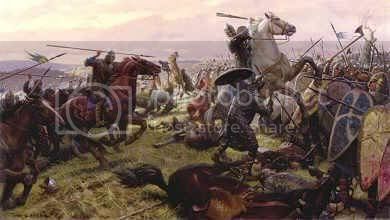 Vortigern bought Saxon mercenaries to fight the barbarous tribes, bringing the wildmen to heel. Yet Vortigern was an ambitious man. Mad with desire for the daughter of Hengest, King of the British Saxons, he married her against the will of his people. He then begain settling savage chieftans from the northman clans along the western coast to defend against Irish invaders. The British lords were not pleased with King Vortigern and rebelled. Vortigern used his Saxon mercenaries to crush them and gave their lands to favorites. Vortigern was forced to kill his own son when the younger man was caught leading yet another rebellion. The Saxon mercenaries eventually proved traitorous at the “Night of Long Knives” and slew nearly all the British leadership. Vortigern was himself subdued by his erstwhile hirelings. Cymric lands suffered humiliation and rapine under their new Saxon overlords. Your father was knighted just afore Aurelius Ambrosius, eldest son of Constantin, landed an army of knights and footmen from Brittany. His ranks swelled with all who would bare sword, lance or hoe. The Red Dragon of Britain was flown and Vortigern fled to northwestern Cambria. Merlin, then a child prophet, foretold the fate of Britain. Aurelius Ambrosius overthrew both Vortigern and the Saxons. The Supreme Collegium unanimously voted for him to be crowned the Pendragon, High King of Britain. Aurelius Pendragon kept the Saxons at bay and led raids unto the Frisian lands. For many years the people of Britain were safe from northman predations. It was but 5 years ago that Aurelius Pendragon was poisoned as his army assembled to face the joined might of Irish tribes and Saxon theods. His brother, Uther, stepped in as king and commander, leading the army to a decisive victory over the invaders. The nobles of Britain were so happy with his success they thereby named Uther High King and successor to his brother. Uther has ruled with an iron fist thus far, allowing no dissent. Irish rebels and Saxons have fled before King Uther’s knights. Daring night raids and sublime tactics allowed King Uther to win against a far superior alliance of the northern kings, bringing them also under his rule. Diplomacy and words of friendship brought the Dukes Caercolun and Cornwall under hand. Now, in the Year of Our Lord 485, more fleets of Saxons gather like stormclouds over the western beaches. They come to aid their kinsman in Britain. King Uther calls up his men and prepares again for war. It is time for you to fight for hearth, kin and king as did your father and grandfather afore him. The army of the Pendragon musters.